Learn how to make a personalized necklace for mom (mum) or grandma, with this easy beginning jewelry making tutorial. A grandma or mom necklace makes an easy homemade gift idea for Mother’s day, Christmas, or her birthday! Mom’s, grandma’s and nana’s love receiving handmade keepsake gifts from their children and grandchildren. If you would like one too, make a mother-daughter necklace or bracelet set! A DIY mom necklace isn’t just for mom or mum. You can make one for grandma or nana too! Young children may need some assistance starting and finishing their homemade mom necklace, while older children, teens and adults will be able to complete this beginning jewelry making project from start to finish on their own. Make sure you read through the directions before starting this beginning beaded jewelry making project. 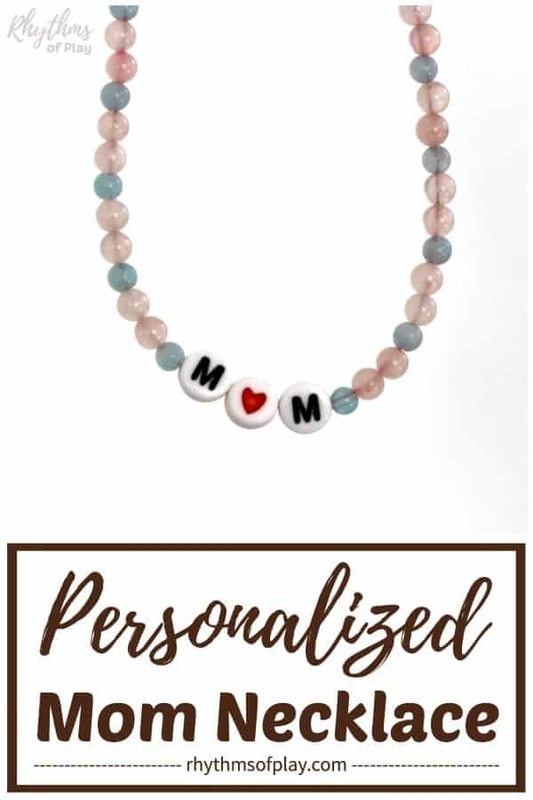 For an extra special touch, use children’s and/or grandchildren’s birth month gemstones to make this personalized necklace for mom or grandma. We used 8mm round gemstone beads for this project because they look good with the alphabet beads that we used. 8mm Faceted beads would work just as easily. If your child has never strung beads before, 10mm round gemstone beads may be a better size, and, would still look good with the alphabet beads. These multi-colored lava-rock gemstone beads come in multiple sizes including 8mm and 10mm as another option. There are a lot more gemstone beads and glass bead options you can use besides gemstones than the ones that I have listed below. Some of the Amazon links provided below have more than one gemstone option available. 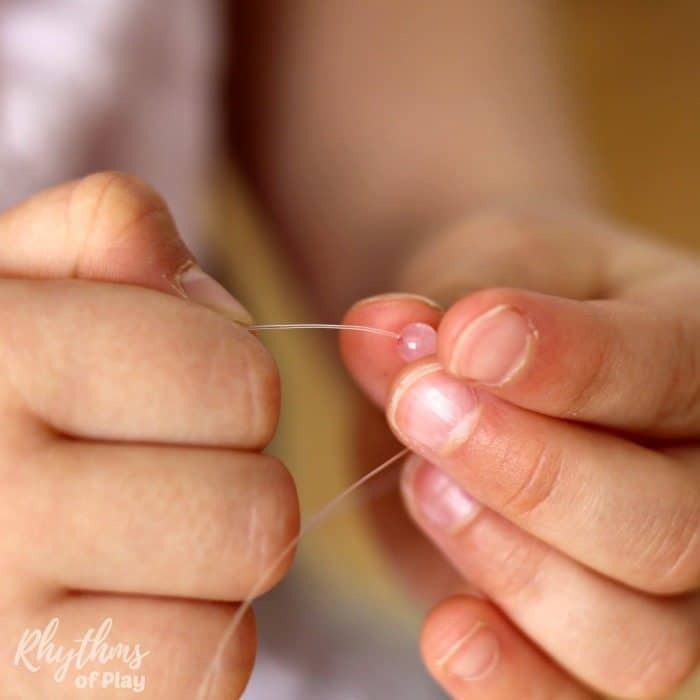 Stringing beads is a great way for children (and older adults) to practice fine motor skills and develop the fine motor muscles in the hand. Creating patterns and counting out beads will create even more learning opportunities for children. Children can also make a name necklace as a preliteracy activity. Choose the gemstone beads, alphabet beads, heart beads, and type of clasp that you would like to use from the bead supply lists provided in the materials section. Use one type or multiple types of beads–you design the necklace with the type of beads that you like. 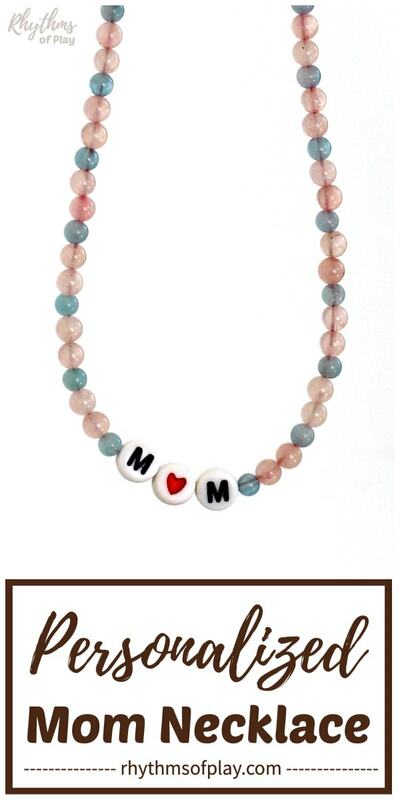 Start, or help your child start their beaded gemstone mom necklace using one of the three methods in how to start and finish a beaded necklace or bracelet. You will find step by step directions for each method with photo tutorials that make it easy. 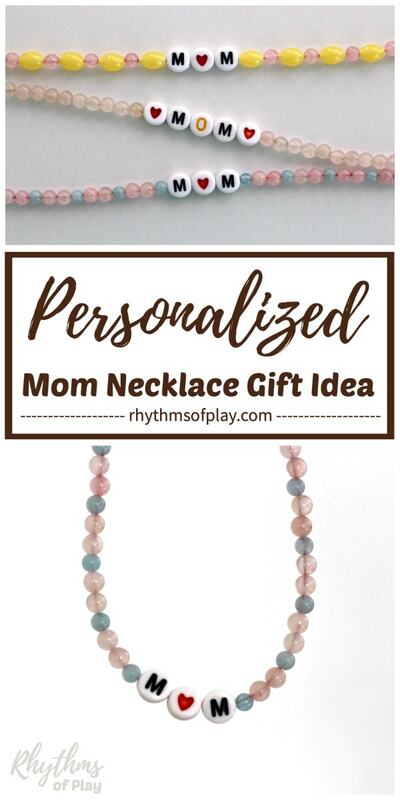 Decide how long you would like the “mom necklace” to be. Necklace lengths are typically 14, 16, 18, 20, and 24 inches long. If you are using more than one type of gemstone decide on the pattern that you will string. Placing beads in patterns on a bead board makes it easy to test ideas. 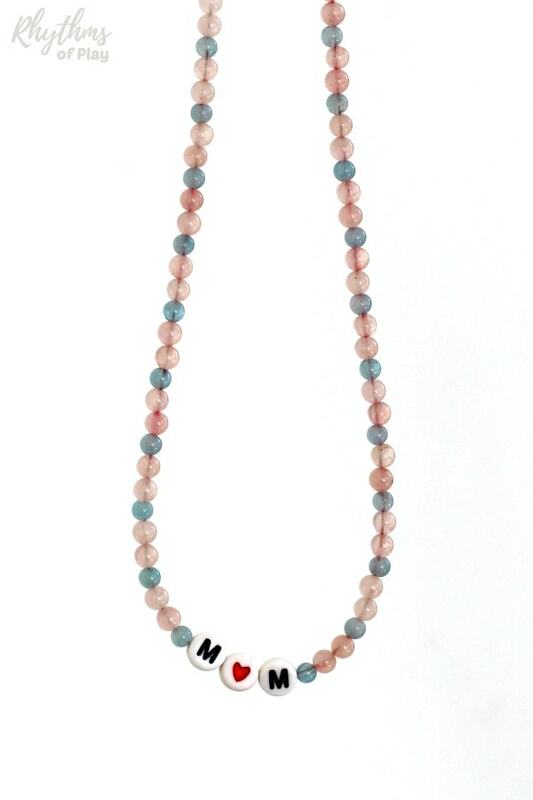 Use your favorite kind of alphabet beads listed above to string “Mom,” “Mum,” “Grandma,” or “Nana” onto the necklace when you are about halfway finished with it. As an example, if you are making a 16-inch necklace, string the alphabet beads onto the necklace when it is 7 3/4 inches long. Once again, using a bead board makes this easy. Make sure to string the same number of beads that you placed on the other side of M-O-M and your good to go. Complete the necklace using the same method you started with. Hop on over to the step by step jewelry making tutorial on how to start and finish a beaded necklace. A DIY mom, grandma or nana necklace makes a perfect homemade Mother’s Day gift idea that kids can make. Mom’s love receiving homemade personalized keepsake gifts from their daughters and sons, while grandmas love gifts from their grandkids. Remember, there are three simple ways to start and finish a necklace for this DIY necklace jewelry project. Infinity, using crimp beads and pliers, or clamshell knot covers. 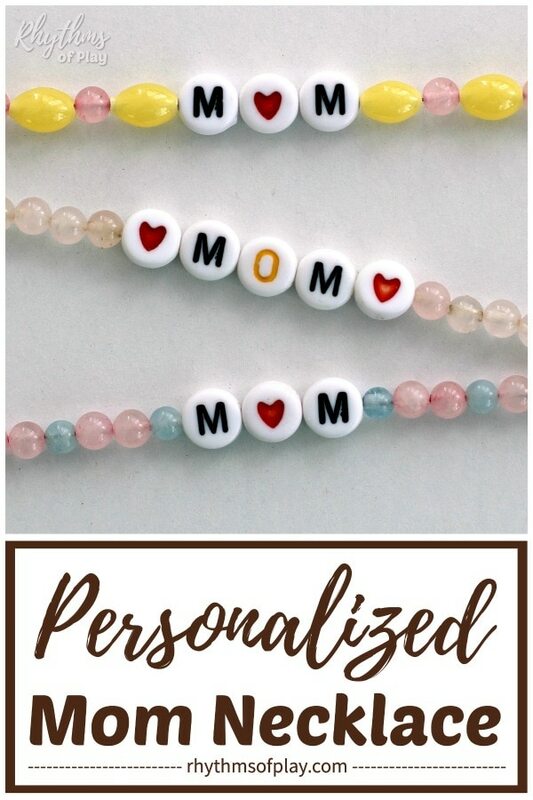 You can even make mother-daughter or BFF, necklace or bracelet sets! For more fun gift ideas check out Homemade Gifts Kids Can Make and Gifts for Mom That Will Put You in the Good Book.